Tuesday we went to Pearl Harbor. We had an awkward time slot, so we didn’t get to see as much as we would have liked. We went to the USS Arizona Memorial as well as the small, at-your-own-pace museum. It was really amazing and powerful. It’s weird to think how racist we were toward Japan, and now Japan’s responsible for my paycheck. I also found it odd how they talked about never forgetting, but at the same time, some Americans slip into the same racism now towards Muslims or the Middle East. If we’re to truly never forget, we wouldn’t take out our anger on an entire race or nation. Regardless, it was amazing to learn about Pearl Harbor and actually see the artifacts from the attack. I’d love to come back someday and see more! This entry was posted in Hawaiian Thanksgiving Vacation 2012 and tagged ewa beach, Hawaii, pearl harbor, thanksgiving, uss arizona, vacation on November 28, 2012 by TheUser. 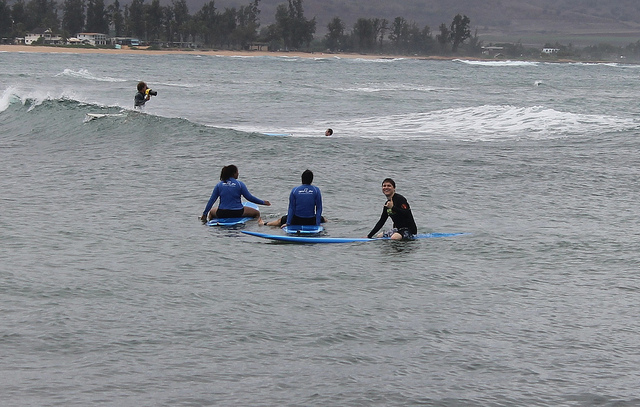 Monday was our fifth day here, and we started with a surfing lesson. 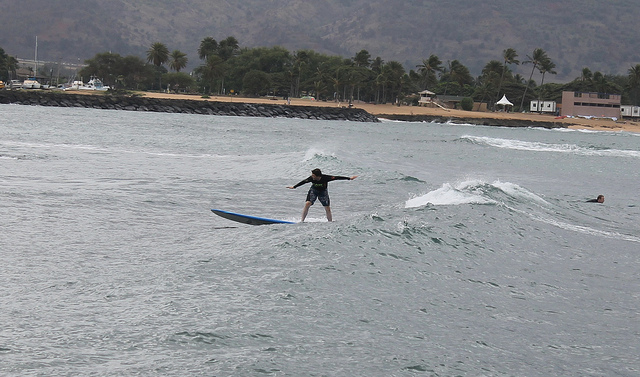 We went with WB Surfing, and our instructors were great. They were a lot of fun and taught us well. I was surprised that we only practiced for five to ten minutes on land before going into the water. My form was far from perfect, but I actually did it! gem took a little longer, but she did it too! Unfortunately, there weren’t any pictures of her surfing that came out well. We didn’t have cash to pay for our photos (because it was unexpected), so we followed them in the rain to the bank. We were all wet, but I guess that’s just a way of life here. We had lunch at Macky’s Shrimp Truck before going to the Dole Plantation. I got gem a pearl, and we got lost in the huge maze. Then we headed to the Paradise Cove Luau! Everyone, staff and customers, was very friendly. We posed with some exotic birds, threw spears, and watched some hula. Dinner was tasty – fried chicken, salmon, pork, a variety of salads, and some tasty desserts. We ate a ton. Whoops. But it was a night. This entry was posted in Hawaiian Thanksgiving Vacation 2012 and tagged food, Hawaii, luau, paradise cove luau, surf, surfing, vacation, wb surfing on November 27, 2012 by TheUser. We started today with snorkeling at Electric Beach. It was a ton of fun! We saw a lot of cool fish and some other odd things underwater. It was hard to get pictures of the fish, but we still managed to capture some cool shots with Alex and Darnell’s GoPro. After snorkeling, we tried to find some geocaches but failed miserably. Luckily we did have a lot of fun exploring and hiking. One of them appeared to be missing, but the other was probably just hidden too well. We went to a lagoon in hopes of seeing sea turtles, but there weren’t any there. It was quite beautiful though. This entry was posted in Hawaiian Thanksgiving Vacation 2012 and tagged alex hurst, beach, Hawaii, vacation on November 26, 2012 by TheUser. We started the day by going to Chinatown and doing some fruit shopping. 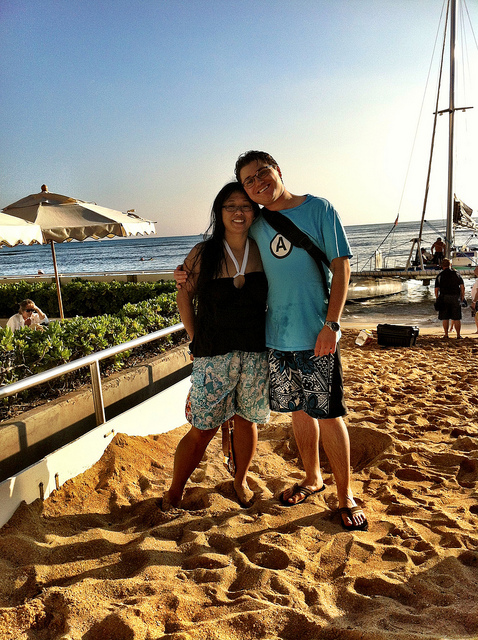 Then we headed to Waikiki to wander around. We ended up stopping on the beach to do some swimming for an hour or so. There might have been some playing in the sand too! Afterward we had Mai Tais while watching the sunset. Then we did some more wandering around the city before stopping for dinner in a little food court. And of course, we played with Tegan a bunch because she’s so adorable! This entry was posted in Hawaiian Thanksgiving Vacation 2012 and tagged beach, Hawaii, Hawaiian Thanksgiving Vacation 2012, vacation, waikiki on November 25, 2012 by TheUser. We began Thanksgiving by going to Ewa Beach! We brought Tegan, who had a ton of fun both in the sand and in the water. We bought bagels with us, so between playing in the sand and swimming in the ocean, we ate some delicious carbs. Back at the house, we played some Settlers of Catan. I had played once previously, Alex had played part of a mock game, and Darnell and gem had never played. It was a lot of fun. For some reason, Alex got pretty screwed. In the end, I won. The highlight of the day was the delicious meal! We had turkey, gravy, mashed potatoes, stuffing, cranberry relish, mushrooms, Brussels sprouts, pineapple au gratin, fresh baked bread, crackers, pretzels, dip, and pumpkin extravaganza! It was amazingly good. We had a wonderful and relaxing Thanksgiving. This entry was posted in Food, Hawaiian Thanksgiving Vacation 2012 and tagged Hawaii, Hawaiian Thanksgiving Vacation 2012, thanksgiving on November 24, 2012 by TheUser. 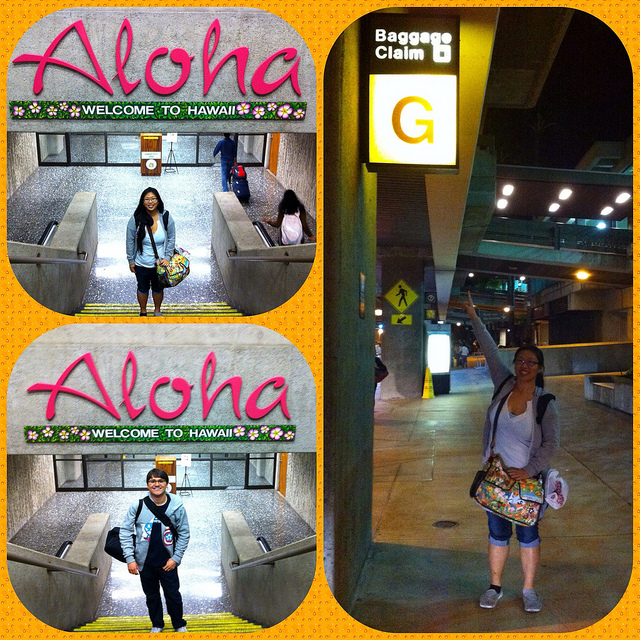 We made it to Hawaii in one piece! Tegan picked us up from the airport with her two humans. We tried to pronounce street names before getting walking and playing with Tegan. It’s late, so it’s off to bed now. This entry was posted in Hawaiian Thanksgiving Vacation 2012 and tagged Hawaii, Hawaiian Thanksgiving vacation, Hawaiian Thanksgiving Vacation 2012, thanksgiving, vacation on November 22, 2012 by TheUser. Raymond Camden wrote a great tutorial on loading style sheets dynamically based on the user’s current weather. He poked fun at himself and the idea a bit at the beginning of his post, but I think it’s honestly a terrifically fun idea. As it’s beginning to get a bit colder as we enter the holiday season, it would be very… cozy… to have a site recognize the weather and respond with some cool blues and whites! Will I get around to implementing something like this? Probably not. But I find it pretty interesting anyways! This entry was posted in Computing, Programming and tagged css, programming, weather, web development on November 12, 2012 by TheUser. Disney did it again with Wreck-It Ralph. I watched it this morning and was thoroughly impressed. Parts of it were definitely predictable, but even if I knew where it would lead, the journey is what’s important after being infused with the Disney magic. And that’s not to say I saw every twist. There were more to the game references than just character cameos. Seeing gaming culture in the movie was fun as it followed the change in popular games and the culture as a whole; although, it was odd that people were even in an arcade. That seems a little old-fashioned, but I do wish I had an arcade like that near me. In addition to the main feature, there was an animated short at the beginning called the Paperman. While Wreck-It Ralph was great because I’m a gamer, the Paperman is a true masterpiece. You should definitely watch both! This entry was posted in Gaming, Movies and tagged disney, paperman, wreck-it ralph on November 3, 2012 by TheUser.